America’s infrastructure is in serious jeopardy. The American Society of Civil Engineers, rating America’s infrastructure on 16 different categories, gives America a “D+” on the state of the infrastructure. The report is clear, America’s infrastructure is aging, insufficient, and becoming dangerous. Rather than doing something about it, politicians on both sides of the aisle cave to political pressure and ignore the problem completely. Infrastructure can be divided into three very broad categories: utilities (energy, disposal, and waterworks), transportation (highways, waterways, and aviation), and public works (schools, parks, and public buildings). When we think of infrastructure, we almost always immediately think of things like bridges and roads — and rightly so. They are used by roughly 253 million small vehicles and 20 million larger transportation trucks. Funding for projects is complicated because it is done at the local, municipal, state, and federal levels –with each agency having competing wants and agendas for funding projects. 2. “Pet projects” (like the “Bridge to Nowhere”) are unlikely to ever become realities when state governments have to fund a larger share. But, to actually comply with the ASCE Report’s recommendations, and enormous outlay would be needed — almost half of the current non-military discretionary budget of the United States. According to a Senate report, America spends less (as a percentage of GDP) than the rest of the developed — and much of the developing — world. America’s post-WWII infrastructure was the envy of the world, but it is losing this status quickly. Since the 1980s, spending has consistently been trimmed on infrastructure, creating a huge gap in the funding needed to even maintain — let alone upgrade — everything it encompasses. S&P estimates that an extra $1.3 billion investment in infrastructure would create 29,000 real jobs. Standard and Poor’s estimates that an extra $1.3 billion investment would create 29,000 real jobs (not politicized ones like with the Keystone) — jobs that pay well, range from low to high skill levels (meaning entry and advancement can be accomplished), and are sustainable for years. Historical evidence has shown us that every $1 spent on real infrastructure increases the economy by $1.15 to $1.25 — this is one of the best real investments Congress can make. But the new Republic-dominated House cut funding on transportation programs in infrastructure by almost 93 percent in the 2015 budget. Money is a harsh political tool. And too many competing political philosophies are at the table negotiating. From those who believe in “no government involvement” to those who are pressing for a “full investment,” the issue always boils down to funding an almost imaginary amount of money. Suppose you had an infinitely long life (or just a really good trust fund) and were able to spend $1 million a day from the beginning of the Christian Era. How much money would you have spent by 2015? Give or take, you’d have spent around $736 billion by this point, spending a million a day for over 2,000 years! 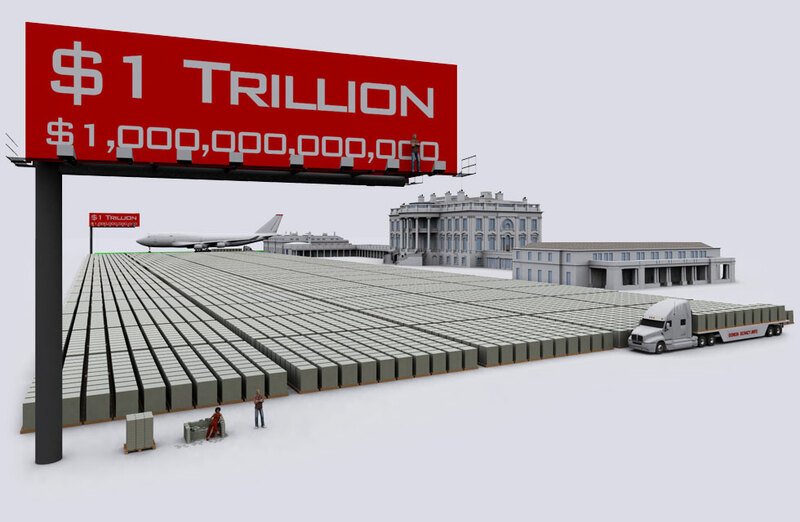 We can barely fathom what a trillion dollars is. In pallets of $100 bills, it would create an amount of money that is almost impossible to securely transport. Yet we do it every day with electronic keystrokes. Once numbers get this large, they lose a sense of realness. As Joseph Stalin has been attributed to saying: The death of one man is a tragedy; the death of millions is a statistic. This same phenomenon plays out in economics. Failing to fix one bridge is a tragedy; failing to fix an entire crumbling infrastructure is only a statistic, one that seems almost insurmountable because of the price tag attached. Is Modern Monetary Theory Economics the Answer? Like the New Deal of the Great Depression, MMT economists argue that government deficit spending is only limited by the capacity of the economy, and not by some credit limit. This is not to say the government has a blank check. If it poured hundreds of trillions of dollars into the economy, the capacity of the economy would be overwhelmed and we would see horrendous inflation. But the argument is that in an economy where we have huge real (and off-the-books) unemployment, we can utilize the unused capacity of the economy to do something “good” for the long term, and not just focus on band-aid programs to alleviate short-term suffering. Spending programs of this nature can be a very good thing, but there’s a political price tag to be paid in the future — one that most politicians won’t ever employ. House GOP cut funding on transportation programs in infrastructure by almost 93% in the 2015 budget. Ever since Keynes, we’ve held the belief that the government should pick up the slack in times of want. However, under the same theories, what is the government’s role in times of plenty? Therein lies the problem: most don’t know — and those politicians that do would find the answer political suicide. During times of plenty, the government has to trim down the debts it has accrued — not fully like President Bill Clinton (who created his own economic problems in doing so) — but it also has to act as a safety valve using taxation, not monetary policy, to keep inflation in check. No matter how good the spending program is, there’s a price tag to be paid at some point. Too often, politicians want to belt-tighten during times of want, when the true belt tightening (and most effective time to do it) is during times of plenty. Most of the great investments into America have failed only because Congress found it politically expedient to “roll-over” the debts incurred rather than actually paying off the investment during times of plenty, and that is the very essence of the modern problems of political spending. What we need to fix our crumbling infrastructure are politicians who are willing to make the tough choices, to spend the money now, but realize and act upon the price tag when the time comes. We don’t have enough politicians with that much veracity and character in the 114th Congress to make and stick to these types of decisions, but we can always hope that they can learn (or even luck into) the correct decisions to improve America’s infrastructure. Author’s note: I studied MMT economics under Dr. Stephanie Kelton, who was recently appointed the Senate Democrats’ Chief Economics adviser for the Budget Committee. It will be interesting to see the types of ideas and programs proposed by the Democrats in this session of congress with a new economic perspective guiding their decision-making.